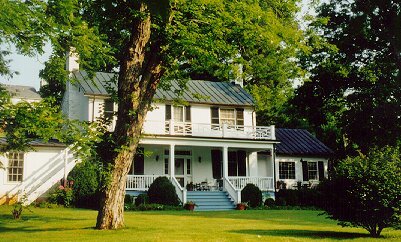 The Inn at Monticello sits on five acres of land close to Jefferson's beloved Monticello. The large rolling front lawn is graced with large trees, a wandering brook, and views of the surrounding mountains. During the warmer months enjoy the gardens, a walk to the brook, or just sit on the porch and listen to nature ... the quietness of it! The chirping of the birds the humming birds dancing in the air, the fireflies by the hundreds on a warm summers night. Enjoy a cool refreshment and forget about the pressing problems of your daily life. During the cooler months enjoy the fireplaces, have a cup of hot tea, or a glass of wine, visit with old or new friends. In short - get away from it all! Each room is decorated with fine antiques, has its own private bath, some have fireplaces, canopy beds or a private porch. We serve a full gourmet breakfast each morning as well as light refreshments in the late afternoon. Our Bed and Breakast is one mile south of 164 on Route 20 South. We are located two hours from Washington D.C. in Charlottesville, VA. The home of the University of Virginia, Jefferson's Monticello, and Monroe's Ashlawn-Highlands. The homes of both Madison and Wilson are only a half hour away. The Skyline Drive, and Blue Ridge Parkway is only 20 minutes away. The area is home to many wineries, as well as part of the Civil War Trail. This and other Charlottesville Virginia Inns can be found here in The Register.